I walked my fingers through my wool yarn the other day, touching and rearranging the skeins, admiring their colors. In reality, I was pondering the idea of introducing a new line of products in JN Originals, my shop on Etsy which features crocheted and felted items. Whether you’re a small shop owner like me or have a large business that reaches into every household across the nation, I suspect that all sellers go through some sort of “research and development” phase—more than one phase, to be sure, since the marketplace is fickle. What’s “in” one year is “out” the next. The super-long, fuzzy “eyelash yarn” scarves of four years ago, for example, have given way to shorter scarves that keep you warm but don’t flap into your face when a gust of wind comes along. If you’re lucky, as a handmade seller, your timing is on and what you sell leaves your doorstep almost as soon as you create it. Sounds ideal, doesn’t it? In reality, there is always a certain amount of risk involved, so you can’t afford to make too many of any one item, or you’ll get stuck with product you cannot sell. But without experimentation, your business is stuck in the water like a ship without sails because nothing is ever static. Before I began selling handmade goods on Etsy, nearly everything I made was gifted to those I knew, both family members and friends, so to some extent these people represented the source of my market analysis. Their “oohs” and “aahs” translated into the sections of my shop including hats and scarves, felted journals and needle books, coffee cup sleeves, fingerless gloves and flower brooches. What I have discovered, however, is that people’s admiration or appreciation of these items does not necessarily result into sales. What people are excited about receiving for free does not excite them so much when they have to reach into their pockets. And there is always a price point beyond which they will not tread, no matter how wonderful your product may be. I have also learned that what sells well online may not sell equally well in person at craft shows. In a word, we’re all on a perpetual search for that one special item that will make our business bloom and sales take off. Sometimes we fall flat on our faces. I tried selling felted napkin rings on Etsy and failed, for example. Research and development can make the bravest among us grow faint of heart! Despite the risks associated with any new item you introduce, there is something magical about the research and development process. You check out your competition for similar items and decide how you want to stand out. Finding a unique angle must always be your goal, for you simply cannot assume you are the only person to generate that idea. And when you finally unveil your product, it feels somewhat like a gift you unwrap and pass around to get everyone’s reaction. 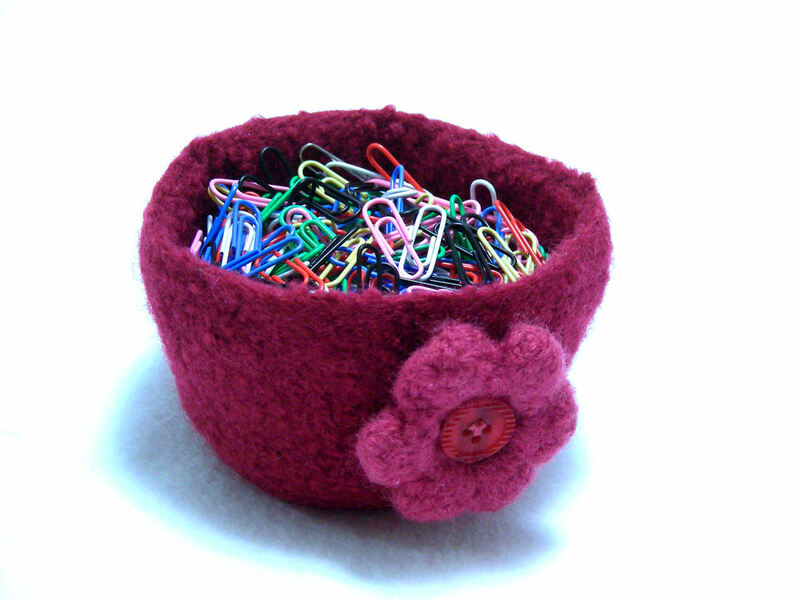 So, that is what I am doing below, where you’ll see a small felted bowl that represents a new product line in my shop. What do you think?! Click on image to learn more about this Challenge. This week, as I was writing 39 pages of script for a Destination Imagination® training podcast that I recorded today and uploaded to the Iowa Affiliate Web site, I looked out my window and regretted that I didn’t have time to enjoy what is likely the last bright hurrah of autumn colors. My husband has been raking leaves all week, and most of the trees are looking pretty bare. 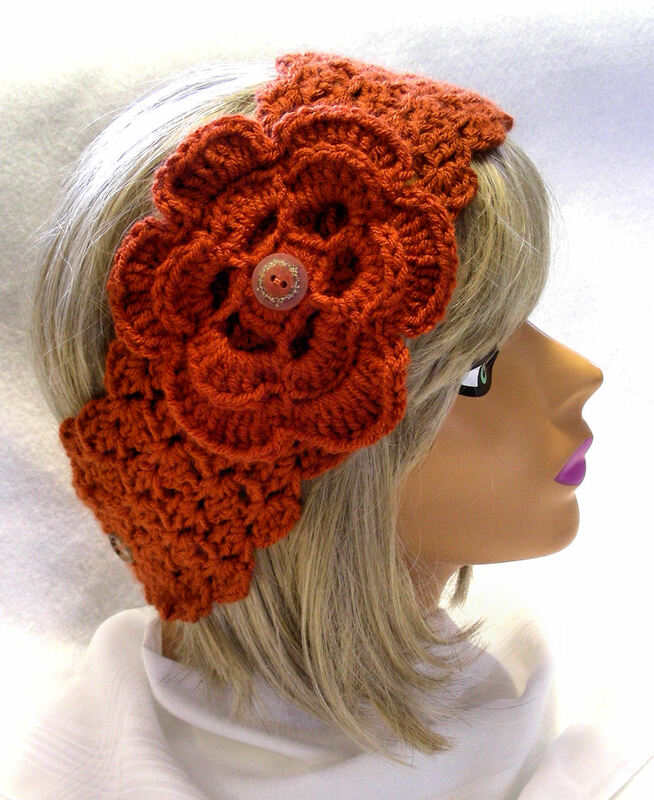 However, the maple tree in our front yard is still hanging on with burnt orange leaves the same color as the crocheted headwarmer shown below. I’ll miss my favorite (and shortest) season when the last leaf falls! The headwarmer, by the way, is available in my Etsy shop. One of my favorite paper crafting tutorial sites is Chic ‘n Scratch, where you can find Stampin’ Up Independent Demonstrator Angie Kennedy Juda’s video gallery. You can also find her videos on YouTube, but Angie has subdivided her more than 300 videos very nicely in her gallery. You can find what you’re looking for in very little time. 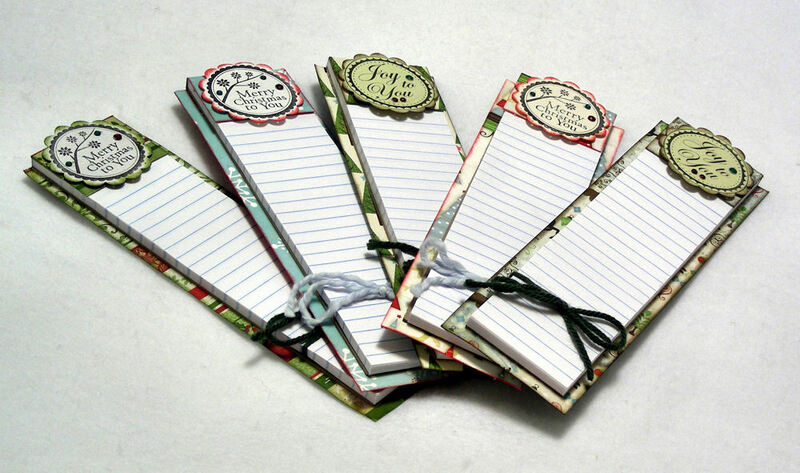 To date I have never purchased Stampin’ Up supplies, although the day will probably come when I just cannot resist! Fortunately, however, I can usually find similar products in other brands locally, so for right now that has worked for me. If you don’t have local scrapbook or craft supply store where you live, then you may wish to purchase from Angie’s Web site. I find that Angie’s tutorials are a good jumping-off point for my own projects, which often turn into impromptu gifts. Speaking of gifts, I suspect that some of my holiday gifts this year will include memo pads that are based on Angie’s Grocery List Notepad video shown below. Cut holiday card stock in a long, narrow strip so that it measures 8.25 in. x 2.5 in. Cut a rectangle from matching or contrasting holiday stock so that it measures 2.5 in. x 2 in. Score the rectangle from Step #3 at 1-7/16 in. and 1-11/16 in. Fold on the score lines. Wrap the rectangle around the top part of the memo pad, and adhere it to the back, top edge and front flap (about 5/8 in. down), as shown in the photo below. Use your favorite adhesive (I used adhesive strips) to adhere the memo pad to the long piece of holiday card stock. Adhere a magnet strip to the back (I did top and bottom strips) so that the pad will stick to your fridge or other metal surface. If you prefer, you can attach a cord loop to the back instead, and then you can hang your memo pad on the wall from a nail or thumbtack. My own results are shown below. Happy paper crafting!